Growing up in Dallas, Boone Powell Jr. was active in First Baptist Church and spent many fall Saturday afternoons listening to Baylor football games on the radio. His father, Boone Powell Sr., was CEO of Baylor Medical Center, the same position his son would hold years later. Powell says he always knew Baylor was the university for him. "I just never considered any other university," he explains. "I met my wife at Baylor our freshman year, and interestingly enough, her dad, Dr. John Hogan, was a physician in Big Spring. Our dads had already met before we did. Peggy and I were married at the end of our junior year, and on this June 7, we celebrated 54 years." At Baylor, it didn't take long for Powell to figure out what career path to pursue. "I was very interested in ministry, but I also greatly enjoyed my business classes," says Powell. "So during my sophomore year at Baylor, those two interests came together as I realized the Lord was calling me into hospital administration." Upon graduating from Baylor in 1959, the Powells headed to graduate school at the University of California at Berkeley. After finishing his master's of public health degree, Powell then completed his management residency at Baptist Medical System in Memphis, Tenn. Powell and his wife returned to Texas where he became assistant administrator at Hendrick Medical Center in Abilene in 1961. At age 33, he was promoted to president. "I was at Hendrick for 19 years. When the person who followed my dad as president/CEO of Baylor Medical Center left, they called me," remembers Powell. Unwilling to ride the coattails of his father's reputation in Baptist healthcare circles, for a long while, Powell declined to interview for the position. "I was totally happy at Hendrick, but after about nine months, I agreed to interview. The Lord opened the door and clearly showed me His will," says Powell, and he became CEO of Baylor HealthCare System in 1980. Powell says that following someone as well known as his father wasn't easy. But as he pondered the passing of leadership from Moses to Joshua, he followed that biblical example. Moses' accomplishments were monumental, yet Joshua wasn't supposed to be another Moses. He just had to be himself, with his own leadership style and objectives for his time. Powell found that delineation very helpful. Over the next two decades, Powell instituted several significant innovations to Baylor University Medical Center. He learned that a key component of managing medical systems is having strong relationships with the medical community and medical staffs. From the beginning, he made sure everyone was on the same page. His first recommendation to the Baylor trustees was to start building a health care system. "When I arrived, Baylor Medical Center was one main hospital campus near downtown Dallas. It was unquestionably excellent in its personnel, patient care, teaching and technology. But with the trends changing in health care payment, I thought we needed to expand by locking in with other facilities and other communities," says Powell. "Our superb Board of Trustees approved the expansion and Baylor Medical Center added multiple hospitals in communities around Dallas such as Garland, Grapevine and Waxahachie. 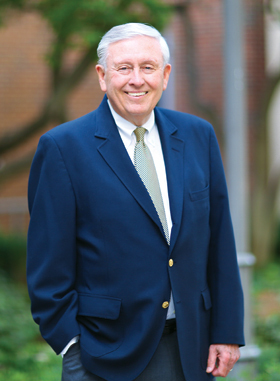 Building the system was critical, and my successor, Joel Allison, BA '70, has continued it very successfully." Another change under Powell was the addition of a pioneering organ transplant center when transplants were still considered experimental procedures. "We spent a year evaluating the prospect, realizing insurance companies did not cover it. Our analysis of the risks emphasized the major clinical undertaking this was, yet we forged ahead, calling it the Baylor Regional Transplant Institute. Now 30 years later, it is still ranked as one of the greatest transplant programs in the world," he says. Powell's leadership also helped create a physician group, now called HealthTexas. A modified employee model with more than 500 physicians, Powell says that, strategically, it has been very helpful in developing the system. Another innovation helped address the nursing shortage in the 1980s. Called the Two Day Alternative and nicknamed The Baylor Plan, Powell's staff was the first hospital to implement different shift patterns for nursing services, enabling many more nurses to work in the hospital. The Baylor Plan is currently popular throughout the U.S. and in many foreign nations. Beginning in 1989 and continuing for 16 years, Powell led many from the Baylor medical staff and nursing services into a medical recovery project with the nation of Romania in the aftermath of its freedom from communism. This project, partnering with Humana, Inc. and The Healthcare Leadership Council of Washington, D.C., has drawn international attention for its medical excellence, perseverance and friendship building between the medical professionals from both nations. Throughout his years in health care, Powell maintained ties to his alma mater. He worked closely with many Regents and former Baylor University President Herbert Reynolds. All three of the Powell children graduated from Baylor and a grandchild, Madison Powell, is continuing the family tradition as a current Baylor student. Powell's family has been faithful in stewardship to the university as well by supporting endowed scholarships, the Nursing School Excellence Fund and the George W. Truett Theological Seminary. He is on the Advisory Board for the Baylor MBA program in healthcare and, on occasion, lectures in classes. The Powell family also has a new interest in the work of the Department of Classics in the study of biblical manuscripts and antiquity. Now "mostly" retired, Powell's influence is still felt at BHCS. His so-called retirement includes serving on several boards, including Young Life, Whitney International University, United Surgical Partners and Erickson Retirement Communities. In the last few years he has climbed a 13,000-foot mountain in Iran on an expedition in search of Noah's ark and studied apologetics at The Summit and at Oxford, England. Mission trips have found him and his wife in Africa, Belarus, Istanbul and the British Isles.